The words “Category 47” may not mean much to most people, but to Zoltun Design they’re music to our ears. 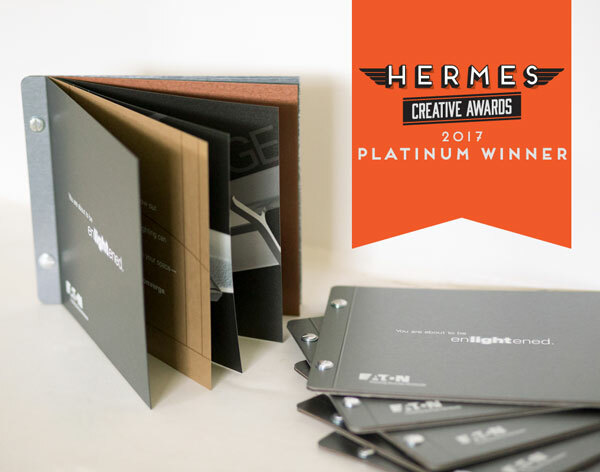 That’s the category that earned us a prestigious Platinum award in the international 2017 Hermes Creative Awards design competition for best-of-the-best invitation. Our creative director, Theresa Poprocky, designed this invitation for Eaton. They were sponsoring 14 events at venues across the United States to introduce their latest LED lighting products—the Converge and the Covera. The target audience was independent commercial architects and large commercial architectural firms. The two Eaton products are very unique, so the invitation needed to be equally unique, contemporary, and attractive to progressive thinkers. From the bold front cover statement, “You are about to be enlightened,” to the creative use of multiple textured paper stocks, striking imagery, and cool industrial screws binding it all together, these invitations are very distinct. Thousands of creative entrants from around the world submitted their finest work in numerous categories, hoping to secure an honorable mention, silver, gold, or the pinnacled platinum. Entries came from as far away as Istanbul, Brussels, Sydney, Singapore, Hong Kong, and Copenhagen… as well as Montreal, Los Angeles, and Chicago. Hermes is sponsored by the Association of Marketing and Communication Professionals. Since 1994, AMCP has judged over 200,000 entries. Hermes is one of the oldest, largest, and most visible awards competitions in the industry. And over the past few years, more than $200,000 has gone to programs that benefit disaster victims, children, the elderly, and the disabled. We are very proud and humbled to have been judged as the highest level of creativity in the 2017 Hermes Creative Awards “Category 47.” If there’s a creative project you’re hoping to get started on soon, please contact us. We’ll put you in a category all your own. See the entry by clicking here or view our portfolio. 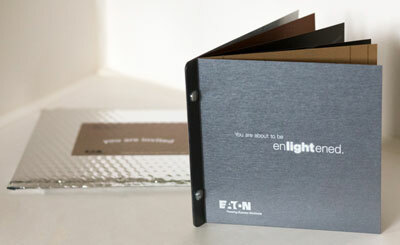 Special thanks to Laurel Print & Graphics for printing the Eaton Architectural Lighting Event Invitation!